It was a good performance from quarterback Matt Ryan, though not quite as good as the box score numbers might suggest, as his two touchdowns on screen passes will inflate his numbers a bit. Ryan did a nice job spreading the defense out and attacking different areas of the field, and he made effective decisions off of RPOs, but there were some inaccurate throws mixed in there, especially when he was under pressure. It was a big game for Julio Jones as he finally gets that no-touchdown omen off his back. Julio didn’t make any spectacular plays in this one, but he was effective and efficient: six of his seven catches went for either a first down or a touchdown, and Matt Ryan had a 131.3 passer rating when targeting him. Falcons cornerback Blidi Wreh-Wilson made some big plays for the Falcons in his limited snaps. While Wreh-Wilson was targeted three times, he did not allow a single reception and broke up two passes, one of which led to an interception by Demontae Kazee. Linebacker Foyesade Oluokon was a key player for the Falcons against the Redskins. Oluokon was able to limit Washington’s yards after the catch and was often able to come up to the line of scrimmage and help against the run. Quarterback Alex Smith had a mixed outing against the Falcons. While he connected with his receivers on multiple deep passes and was the victim of several drops, he was also fortunate not to turn the ball over more than once as cornerback Desmond Trufant dropped numerous interceptions. The Washington offensive line was once again hit by injuries as guards Shawn Lauvao and Brandon Scherff and tackle Morgan Moses all had to leave the game. While Moses was able to return, the whole unit struggled in the absence of three of its regular starters as they allowed multiple quick pressures and were unable to get the running game going. Washington really struggled to get things going in the pass-rush against the Falcons. Ryan Kerrigan and Matt Ioannidis were both able to get into the backfield to record a sack, but outside of those two plays Matt Ryan really only faced pressure a handful of times. Daron Payne and Jonathan Allen were virtually non-existent as pass-rushers in the defensive interior. 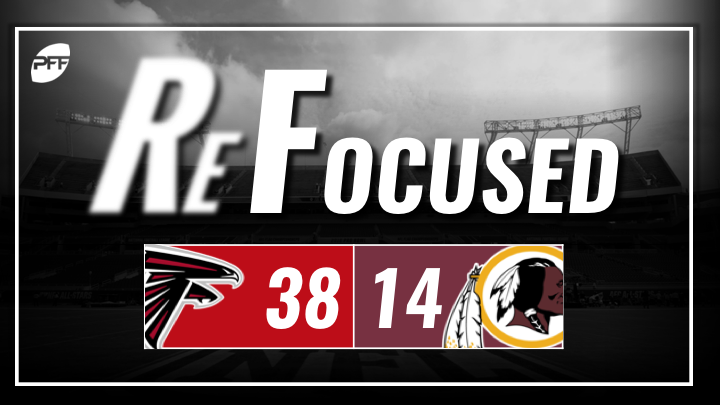 Washington’s defensive front didn’t just struggle to rush the passer; they also didn’t have many answers when it came to stopping Atlanta’s run game. Both Falcons running backs had consistent success moving the ball on the ground and on many plays they weren’t even getting touched until they were already 3-4 yards downfield. Atlanta: The Falcons offensive line won the battle against Washington’s defensive line both in pass protection and on the ground. Washington: The injuries along the offensive line were too much for the Redskins offense to overcome as Alex Smith was under pressure fairly often, which prevented the team from finding a rhythm.